Last week I was privileged to be in the presence of a truly great mind, Bruce Mau. The man who, over 15 years ago, brought use S,M,L,XL presented to the TN2020 summit his design philosophy, ecology of methods and some fascinating results. Now based in Chicago, Bruce Mau is the Chief Creative Officer of Bruce Mau Design, author and publisher of many award-winning books and widely regarded as a visionary and world-leading innovator. 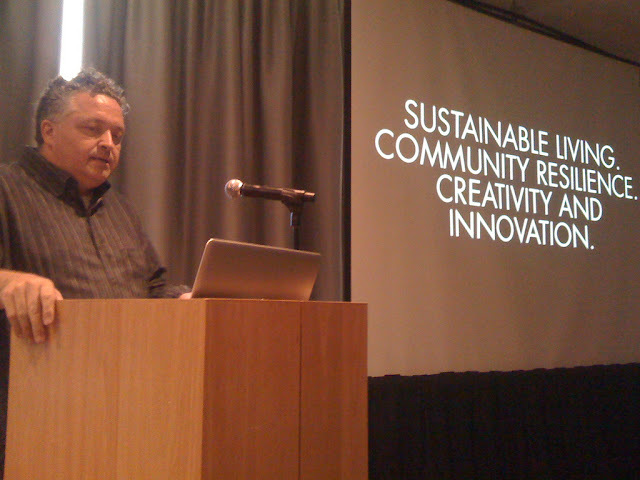 Bruce opened his presentation on Sustainable Living | Community Resilience | Creativity and Innovation with some insights from his widely acclaimed ‘Incomplete Manifesto for Growth’. 1. Allow events to change you. In order to grow, you need to be willing to move away from what you do today. 9. Begin Anywhere. Don’t wait until you know what to do. 14. Don’t be cool. Cool is conservative fear dressed in black. Someone who is cool is not going to take a risk. Being cool is limiting yourself by fear and is ultimately cynical. Cool is self-marginalized, cool is knowing where the boundaries are. Designers cannot afford to be cool. 20. Be careful to take risks. Today is the child of your past and the father of tomorrow. We have to experience the future in the present or you don’t have one. There is Talent and Method. Talent is represented by a natural ability in people to see patterns where others cannot. Method represents a complex ecology of methods put together specifically for you, by you. An ecology of methods is not the ‘7 steps approach’ but more so a manifesto, written as a playbook. Mau uses American Football as an analogy for design. To win the coach needs, as a designer needs, talented players on the field, a great playbook and also the ability of knowing the right play to call. Why do you work? For Mau, it is about FREEDOM, BEAUTY and OPTIMISM. Mau affirms his believes by stating “We will not achieve a beautiful future by articulating it negatively”. It is about being committed to saying ‘I believe in beauty.” It’s about having the conviction in saying ‘I don’t work for money, I work for beauty’. CLARITY, Mau proclaims, is a common ambition. “Whether it is the smallest thing, or the largest plan, people are looking for clarity in a noisy world”. People want to be drawn into the foreground so that we can find them. If you don’t propose your vision with clarity it will be smothered by other people’s noise. WEALTH is married to BEAUTY. Much as we need to create a more beautiful world, we need to create a wealthier world. Wealth can be redefined to not just a wealth of finance, but also a wealth of access, mobility, health etc. Speaking briefly about the Seattle library project, he mentioned how it successfully gave to the people of Seattle an understanding of their own ability to shape their future. The way this was done was through a fully engaging public process that meant each and every design meeting was open to the public. After all it is the library that represents the cornerstone of democracy. Seattle Public Library was a great example of building resilient communities. Massive Change, as it says in bold font on the back of book, is “not about the world of design, but the design of the world”. In order to create a better world, there exists a collective responsibility to design. If we are going to be able to mitigate and adapt to the effects of climate change, then we need to design these solutions of mitigation and adaptation. Mau tells us that the problems the world faces today are not problems of failure but problems of success. There are 6 billion people living in the world today because of the collective success of food production and disease eradication. There are more children in India than the entire population of the United States. In the next 50 years the world’s population will grow from 6 billion to 9 billion. This means that half of today’s global population will need housing in the next half century. The ultimate goal of design, according to Mau, is sustainability. We can design the negative impacts out, or even make them positive. One such example is the story behind the exhibition panels used by Bruce Mau Design in their exhibition on Sustainability. The wallboards were made from paper made manufactured from cow manure. This is a great example of how outputs can become inputs but these solutions can only be developed by lateral thinking and understanding the cycle of things, rather than just a linear equation. 1. Show what is already happening. 2. Provide tools for change and design tools that others can use. 3. Connect the world to you. The project that really captivated the crowd was Bruce Mau’s work in Guatemala, a country ravaged by poverty and an appalling illiteracy rate. There, BMD was involved in the designing of a social movement named ¡GUATEAMALA! In a simple rebranding exercise, BMD suggested taking Guatemala and simply adding one letter, Guate-A-mala. 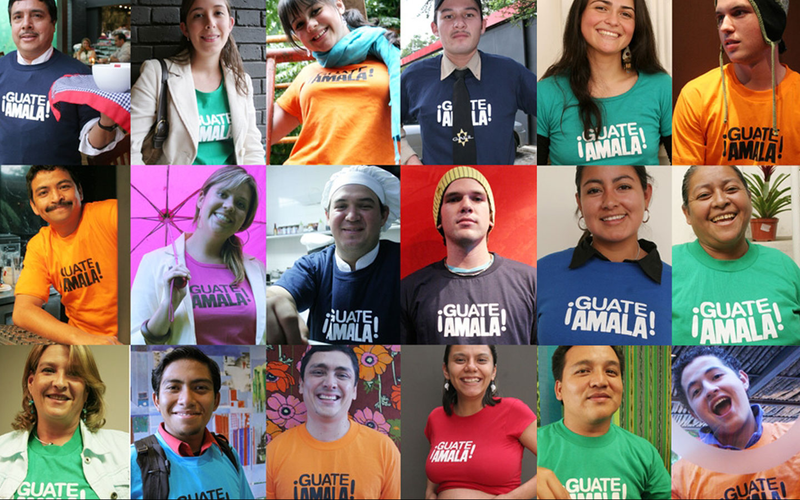 Guatemala translates simply as ‘bad place’, but through this movement the country is transformed to a positive image of itself. It is transformed to Guate¡Amala! Which translates simply as ‘the love of Guate’. In using the process above, BMD successfully brought together 30 social entrepreneurs that were already making change happen in the country, but not necessarily in the know of each others activities. It is important to note that in Guatemala, there was no existing database on what exactly was going on in the country regarding social entrepreneurship. Connecting people together was the smart thing to do. How do you define smart? Simple, Infrastructure integrated with intellect. Before they finished presenting their work to each other, there were already collaborations happening. 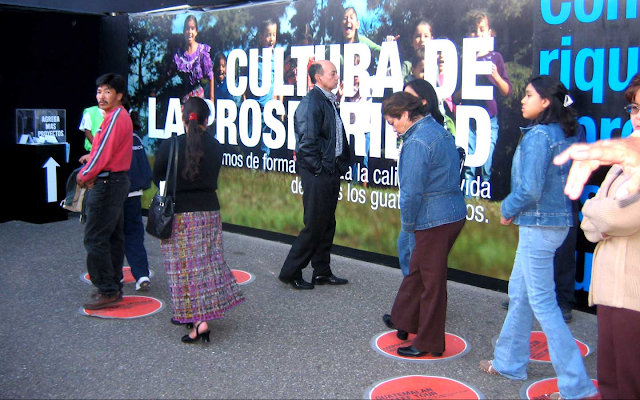 In a public exhibition BMD used ‘Postering’, a graphic design tool to visual success. It wasn’t long until there were over 200 ¡GuateAmala! Leaders changing the country using the tools that BMD had taught them to use, tools such as Postering, Mapping and Real Listening. When you can see a vision of the future ‘brand the opportunity’ and use it to connect the world to you. Bruce Mau's presentation to the TN2020 fellows can be seen below.